We subscribe to SWG not only for the entertainment, but also the challenge. I've found that the crafting and merchant system, when coupled together, presents a unique challenge that I cannot find in any other game of its kind. The task of creating a product line and finding a way to turn a profit is complex and rewarding. If only there was a way to translate this feeling into other areas of the game. Anything that is a time sink will simply force players to find AFK ways to achieve the ends. While I personally have only used AFK harvesting, one might suggest that this is even too much. If I were told that I could solve a series of mental challenges over the course of, say, an hour (all of which are somewhat immersive and relavent to the concept of harvesting resources), instead of parking my toon down on a high yield and triggering a macro, then I would leap at the chance. The same should hold true for the acquisition of junk and collection items. Why should it be a long, tedious, boring and... AFK... session to acquire a stack of software modules? Better that I visit, for instance, a medical center and speak with one of the technicians on duty. They offer to sell me a few, or send me on an errand or two. "I've a few extra modules, sure. But say... you look like a capable fighter. Mind helping me out with some trouble I'm in with Borvo?" And wouldn't it just make sense to visit Tosche Station to pick up some power converters? Did you ever have a need to travel to a different planet, but were unsure which starport you should dock with in order to be close to your final destination? 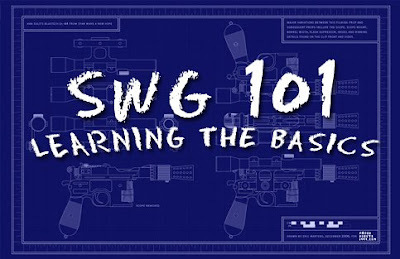 For this edition of SWG 101, we will discuss how the world maps are designed and how you might best estimate what region of the world your destination lies. Consider the following map; a region of Kashyyyk. Now, imagine that the map is divided into four even parts in a 2x2 grid. This establishes the center point of the map. We'll call the vertical line the "Prime Meridian" and the horizontal line the "Equator". At this intersection, the map coordinates are 0,0. This means if you entered in "/way 0, 0" you would create a waypoint at the center of the map that you are currently on. When creating a waypoint, the first value is the x coordinate, which establishes the left-to-right location of the waypoint. The second value is the y coordinate, which establishes the up-to-down location of the waypoint. Anything left of the Prime Meridian is considered a negative value for the x coordinate. Anything below the Equator is considered a negative value for the y coordinate. Thus, any waypoint that is both below the Equator and left of the Prime Merdian would have coordinates that are both negative. For example: /way -200, -500. Conversely, if the waypoint is right of the Prime Meridian and above the Equator, the coordinates will both be positive. The positive and negative numbers may also be mixed. For instance, you may know that Theed is located in the upper left region of Naboo's world map. That means that Theed has a negative x coordinate (left of the Prime Merdian) and a positive y coordinate (above the Equator). Another city on Naboo is Moenia. The coordinates for the starport are 4708, -4693. From those coordinates, can you determine which part of the world Moenia is located? Good luck and be sure to impress your groupmates by knowing exactly where to land every time! It's been suggested that the economy is completely broken in SWG, but I would ask in return: "By what standard is it failing to live up to?" An employee has received his walking papers due to downsizing of his company. What is he to do? The real question is... "What would his toon do?" So he marches over to the Accounting department and picks up a stack of outgoing mail. "I'm going to deliver this for you." Looking up from her computer screen, the Accounts Payable manager nods. "Sure. I'll pay you 2,000 dollars to do so. If you return, we'll have more." "Three cubicles to the east. Here, why not take another stack of papers to the fourth door down. I will pay you 1,800 dollars for that." The employee nods and smiles, grabbing up the stacks of mail. "Two deliveries to the east! And I didn't even have to refresh." The manager goes back to her computer screen. "There will be more stacks of mail when you return. And of course, you will be paid." Upon arriving at the the destination, he finds the receptionist handing a stack of money to the lanky DBA that was laid off yesterday. The receptionist takes off her headset. "It appears you are working for someone else. Would you rather work for me?" The DBA fans his money. "Dude... 3,000 dollars. Repeatable quest. Wanna group up?" 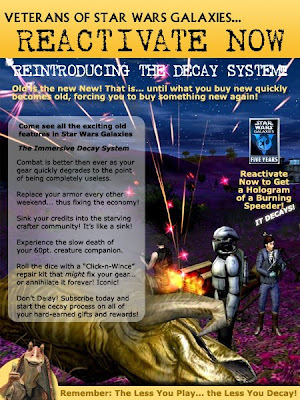 SWG's economy is working as intended; like it... or not. Pictured above is the First Aid Trainer who was stationed in the Laurus, Corellia City Hall. In fact, there were numerous trainers that could be found in the grand hall located at the center of the rank 4 city, including all of the starter professions. For those who may not be familiar with the concept, Trainers were NPCs that could train characters in a skill that they qualified for. They were not cheap, but were an alternative to finding another player whose toon had the desired skill. Trainers could be found all over the galaxy in static places, but politicians could learn the ability to place trainers in their cities. During the first (and ultimately only) Laurus Training Days - a city-sponsored event that helped beginner toons gain experience through the help of veteran toons - all of the trainers were brought outside into the main courtyard along with a few new trainers. Trainers offered a level of complexity and choice to the game, a system abandoned for the insta-level-up system that is in place now. Instant gratification for an instant-gratification target audience. 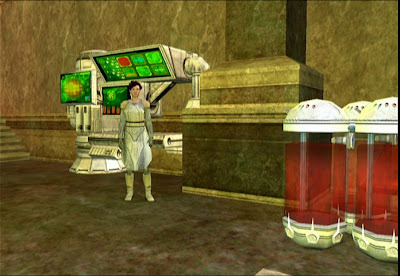 On a related note, in a future "Classic SWG" I will post some images from the Laurus Training Days, including the citizens and squad members assembling in the cantina for buffs prior to heading out on their adventures. If one could stand here, with absolute conviction, and say that gone are the days of the massive overhauls of a single profession that eats up a quarter of the year for developer time, consumes an entire release and precedes the reams of bitching for the remainder of the year, then I would reward such a person with no less then my undying respect, a tip of the hat, and a chicken salad sandwich. That's not to say Engineers currently need tiny updates; let's fix that profession and move on. There. Is it done yet? How about now? It should have been completed by the end of this paragraph. Ridiculous. Moving on, now that Engineers are fixed (finished?) (Aren't they?) (Is this thing on?). I heard tell that Medics feel that their DPS is a little low. For the love of all that's holy, don't give them twenty new heals, a new weapon, mega-buffs, and enough firepower to make them out-damage a commando. Here's a thought... just give them a 5% increase on their DPS. Just for a few weeks. And then we can see how that shakes out. If it's too much, dial it back to 3% and try again. Not enough? Why not kick it up a notch or two. Imagine that! Have the devs learned this at long last? I think so, and for that I applaud them. But I'll believe it when I see it. And they may still not get a chicken salad sandwich. There's just not enough to go around, and I'd rather keep the devs hungry and working then fed and complacent.